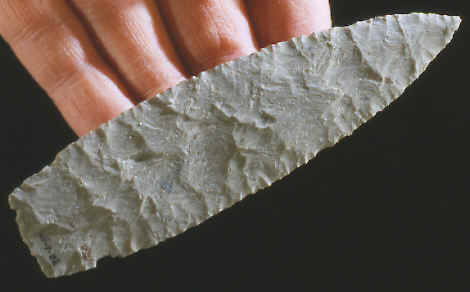 This very thin bifacially flaked knife was found during a scientific excavation at Wallace Ruin near Cortez, Colorado. Bifacially flaked artifacts, other than projectile points and drills, are not common in Pueblo II-III sites (Bradley 1988). This knife was expertly crafted by its maker who used superb percussion thinning. This blade is a Pueblo II-III knife that dates approximately A.D. 900 - 1300. It's made of dark gray Burro Canyon quartzite and measures 4 7/16 inches long. It most probably would have been hafted onto a short handle made of either antler, bone or wood. 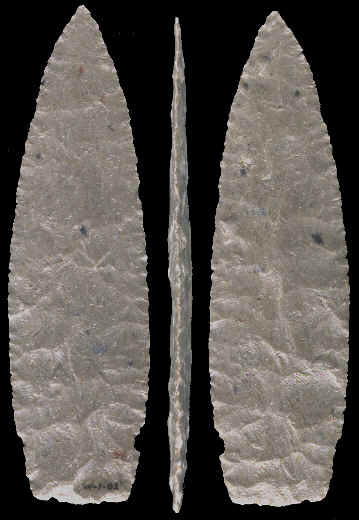 This picture shows three views of this cast of a Pueblo II-III knife. Notice how extremely thin it is. On the Colorado Plateau of northeastern Arizona, southwestern New Mexico, southeastern Utah and southwestern Colorado the Archaic was followed by a culture termed the Anasazi. This was a generalized village dwelling group which relied primarily on the cultivation of corn, beans and squash. Hunting did remain as part of the food gathering process throughout the Anasazi era. There is growing evidence that warfare may also have played a small role in Anasazi society. The Anasazi era has been separated into two major divisions: (1) the Basketmaker, and (2) the Pueblo. Each of these is further subdivided into social organizations. The Anasazi era is usually considered to fall between A.D. 1 and A.D. 1300. This time was followed by further development of a pueblo dwelling culture which is still existing today in New Mexico and Arizona. Personal communication with Dr. Bruce Bradley.